Earning a living as a photographer, especially a portrait photographer can be extremely challenging. Sure, you’re confident your technical and creative skills are top notch and you have a steady stream of clients — still your profitability is not what you envisioned when you started your photography business. So What’s Keeping You from Maximizing Your Earnings? There are two activities that typically cost the professional photographer the most time and money — these are going out to shoot on location and the post production of images. Fortunately, utilizing green screen photography and software can make these activities significantly more efficient — and at the same time can even expand your business by broadening your in-demand photo services for clients. It allows you to shoot your subject in your perfect studio lighting conditions — free from location challenges, including unpredictable weather that can literally waste your entire day! Through the use of specialized green screen software, you can easily replace the green (or sometimes blue) background with any background image of your choosing. You can put your subject(s) into a familiar, local scene where you’ve gone out and collected great background shots or far off exotic locations — even artistic fantasies. You now have the ability to place your subject in ANY location or with ANY background after a simple and inexpensive studio shoot. Your subject’s ‘image environment’ is limited only by you or your designer’s creativity. Don’t Let Post-Production Time Zap Your Bottom Line! One of the main culprits keeping you from achieving greater profitability is often the enormous amount of time spent in the post production of images. Many amateurs, as well as professionals, spend an inordinate amount of time working with their images. This is why it’s critical for you to incorporate more efficient post production tools and to learn the balance between being ‘good enough’ and ‘perfection’. Fortunately, just because you’re using green screen images, which obviously requires you to add a the image environment, doesn’t mean that you have to spend an inordinate amount of time in post production. 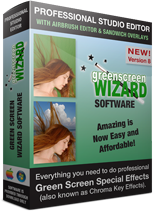 Green Screen Wizard Pro software has unique features that allow you to quickly and easily change backgrounds and make image adjustments. Its Airbrush Editor has 15 functions, including Restore Foreground (when a bride is holding green flowers for instance), Blend (for semi transparent areas where you want to see both the foreground and background), Hair (allows you to restore even the finest hairs against the background), and more. 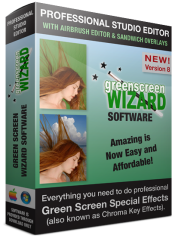 Plus, the latest release of Green Screen Wizard Pro Version 9.0, has it’s own built-in Special Effects. You can choose from B&W and Sepia, Advanced Silhouette, Framing Options, Add Reflections, Skin Smoothing, Artistic Texture, and Lighting Effects. Each of these stunning special effects represents a giant leap forward. No other green screen software provides anything close to these features. Green Screen Wizard was created by a photographer and has been refined over nearly a decade. It is designed to save you time during post production and unlike any other chroma key software, it will allow you to tap your creativity and offer your clients images they never knew were possible.